I recently spent nine days in Paris, without Joan or Sylvie, to do various things: check on renovations of our kitchen and bathroom, attend the annual shareholders' meeting of our building and attend the opening of Jeffrey Horvitz's marvelous show of 18th century French drawings at the Petit Palais and, the cherry on the sundae, to attend the ceremony in which Jeffrey was named a chevalier of the Légion d'Honneur. When I am alone in Paris, I seldom go to great restaurants, preferring to save that pleasure for sharing with Joan. Instead, I cook simple things at home, taking advantage of the great products that are available, and go to simple restaurants. The day of my arrival, I made a pleurotte omelet with grated two-year old comté. 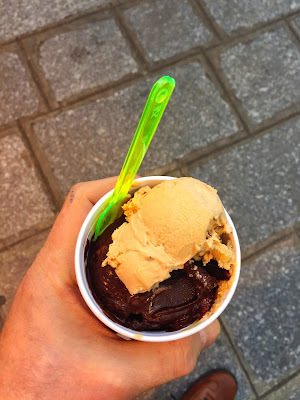 But even before dinner, I took a walk on the Île Saint-Louis and got a bitter chocolate sorbet with pine nut praline ice cream at Berthillon. The next day, I went with a friend to the well-know brasserie le Stella, in the 16th arrondissement, where I had a perfect steak tartare. This dish is generally served with capers, onions, mustard, worcestershire sauce and, sometimes, hot sauce on the side, which you mix in to taste. (Usually I mix in a lot of everything.) 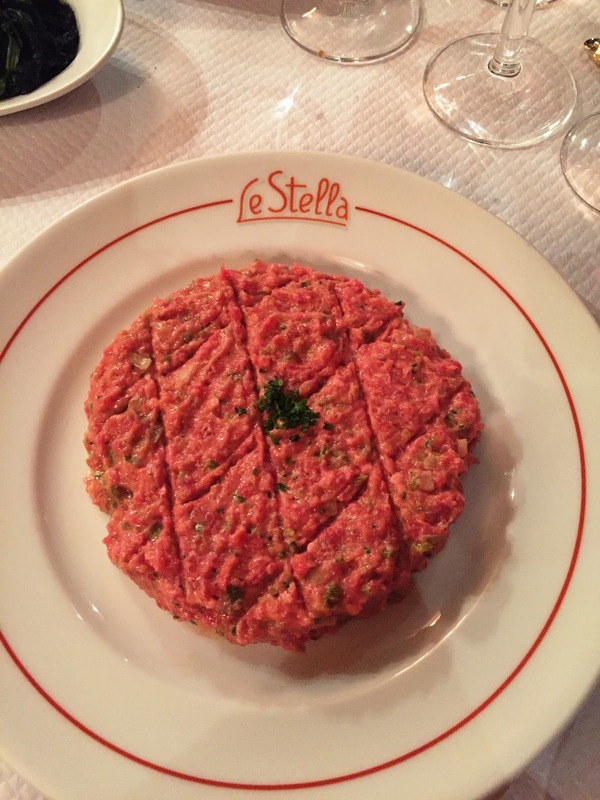 Le Stella serves theirs with everything already in, all chopped extremely fine so the texture is silken and uniform, and the seasoning is perfect! 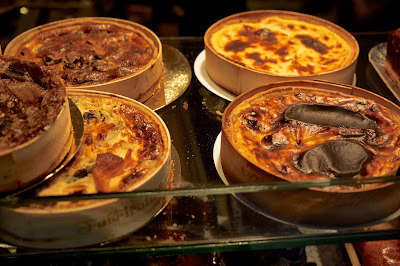 During our last trip to Paris, we had fantastic bread at Restaurant H, and asked where they got it. The answer was Ernest et Valentin, quite far to the East of our apartment. This time I walked there (whew!) and admired the flans and other things in the window, and bought a piece of the flan, a croissant and some whole wheat bread. All were quite delicious, and I was not surprised to learn that they were voted the best bakery in Île de France by M6, a television chain, in 2016. On my third night, I made one of my go-to Parisian dinners, truffled boudin blanc with Puy lentls. Always a treat, and I got to break in my new induction cooktop and electric broiler. Sunday, I made quesadillas with some lovely speck and a melange of comté and emmenthal cheeses on Lebanese flatbread. On day five, I ate at an excellent small Thai place about five minutes away, and enjoyed my usual: the very spicy Tom Yang soup with shrimp and duck breast with green curry. The next day, lunch consisted of a wonderful pork cheek stew that I made at a cooking lesson the day before; the meat was the tenderest pork I have ever eaten and the taste was rich and complex due to the mixture with assorted vegetables. 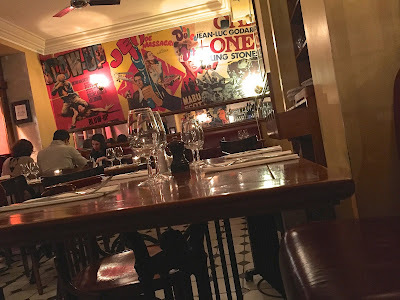 Later, after attending the opening of the very impressive Salon de Dessin at the Bourse, I joined Jeffrey and a group for dinner at the nearby classic Bistrot de l'Opéra Comique, where for some reason they didn't like me and kept forgetting my orders. The food was fine, however, when it finally arrived, and a good time was had by all. Day seven saw Jeffrey's induction into the Légion d'Honneur in a dignified ceremony at the resplendent Quai d'Orsay, after which I went to my favorite oyster bar at Garnier, near Gare St-Lazare, for the assorted oyster platter and some bulots. The next day was the shareholders' meeting mentioned above, after which I joined the president of the board of our building and her husband and daugher at Chez Margot, a nice bistro about 100 meters away, where their son is a waiter. Very nice moules marinière. 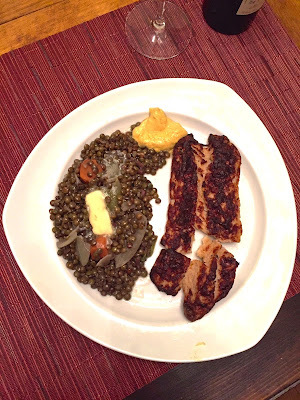 My last night was spent with friends at their home, where we dined on dos de cabillaud, a very popular French dish. Cabillaud means cod but it is not at all like our cod. I brought what turned out to be a very tasty pork terrine that I had made earlier in the week at the cooking class referred to above. Prodigious amounts of wine were consumed in accompaniment of this lovely meal. Not a week of showstoppers, but lots of good eats nonetheless. It's Paris after all. This was the month of chocolate babka. 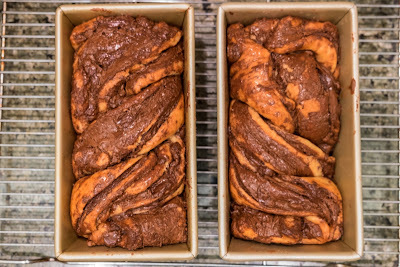 Inspired by my success making challah from Uri Scheft's Breaking Breads, I decided to try making Scheft's chocolate babka. 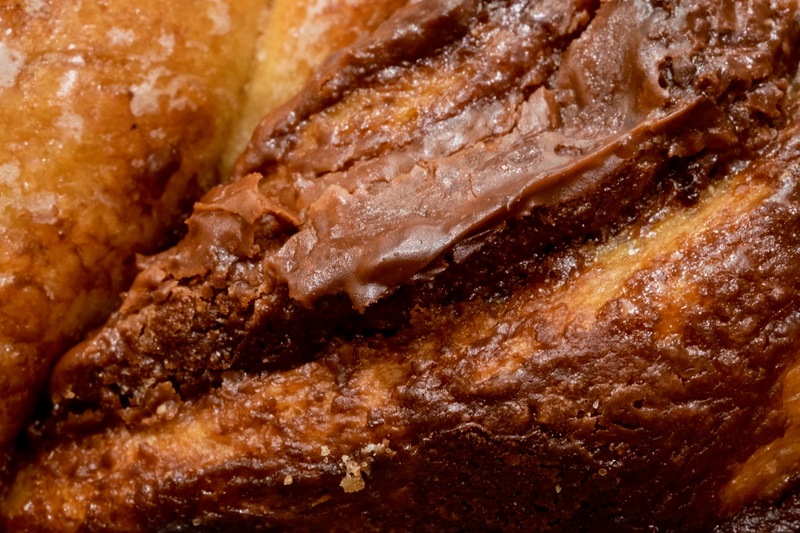 His babka, available at Breads Bakery, is credited with starting a babka craze. 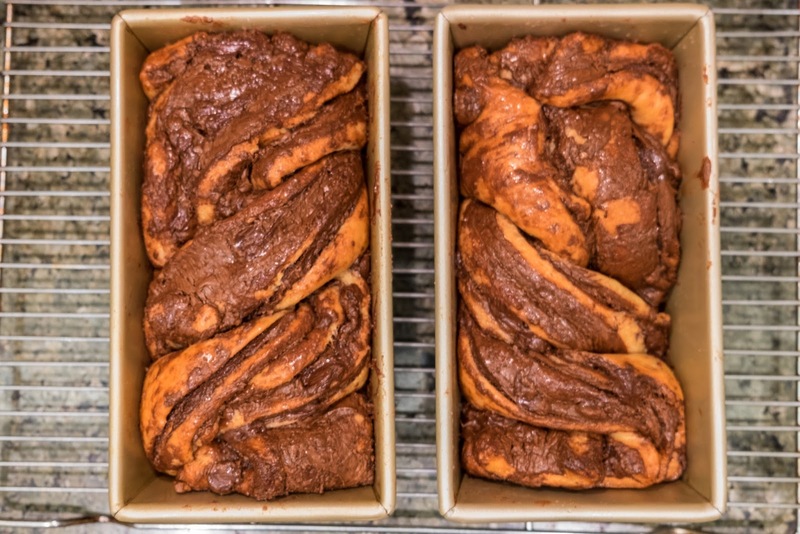 Sheft presents two kinds of babka dough: basic and advanced. I used basic, which is a fairly simple to make yeast dough, which is turned into babka after resting a day in the fridge. 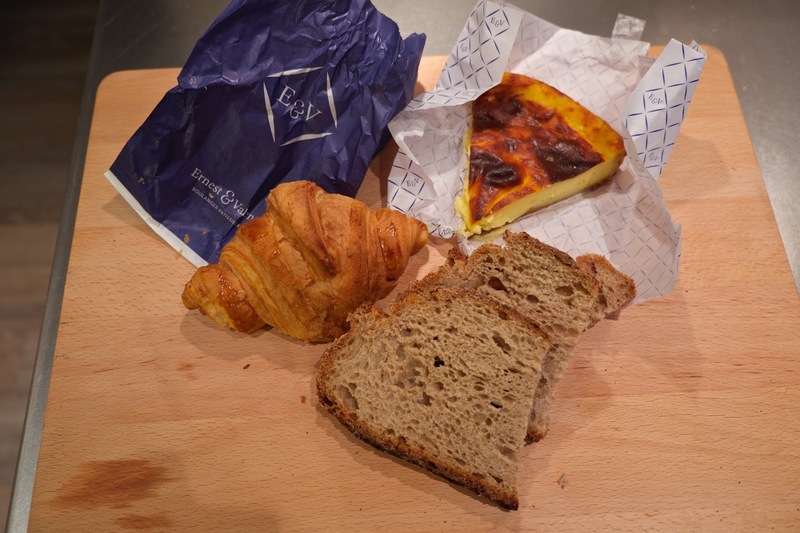 Advanced, which is what Sheft uses at Breads Bakery, is a laminated dough, made by folding butter into the basic dough - using the same method as one uses to make puff pastry or croissants - and then waiting a further 24 hours. 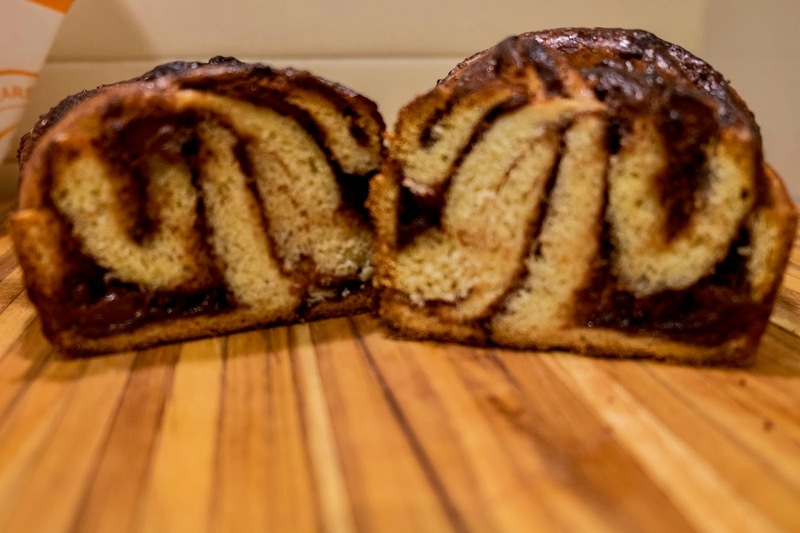 I'm sure the advanced makes a better (flakier and even richer) babka, but the one made with the basic dough is utterly fantastic. Once you have the dough, you roll it out and then spread a pound (literally!) of Nutella and a third of a pound of chocolate chips on top, then roll it into a long cylinder, cut that into four pieces and braid them together, making two loaves. 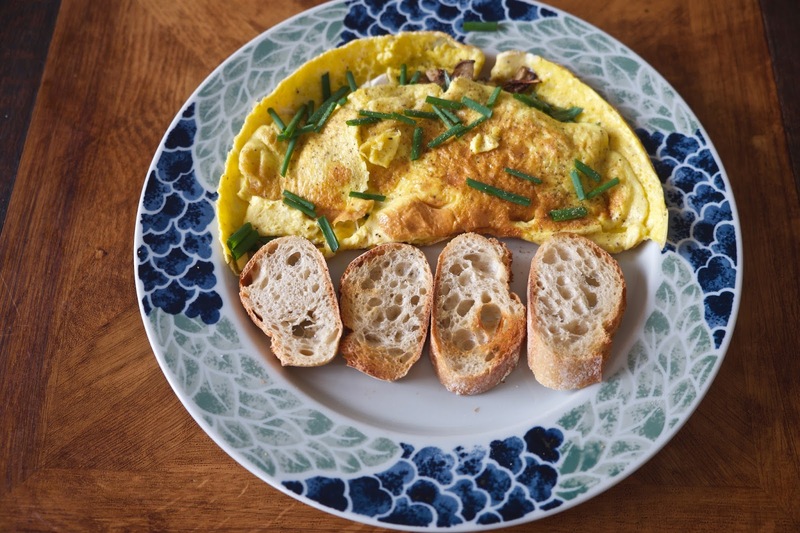 A three-hour rise in two bread pans and you are good to go. I made chocolate babka twice, once to give a loaf to an ailing friend, and the second time for Joan to sserve to clients at her Japanese art gallery. An unqualified hit each time! Now I am faced with a dilemma: for my next project, should I go for broke and try the advanced dough, or try a cinnamon raisin-walnut or a rum raisin and cheese babka next? I will probably go for the advanced, just because the challenge is irresistible. I'll report back either way.